Almost all of the rooms in the villa afford breathtaking views, including panoramic views of the harbor, the town of Saint Tropez and the entire Gulf of Saint Tropez. On some days, you can even see the Estérel Mountains and the lighthouse on Cap Ferrat. 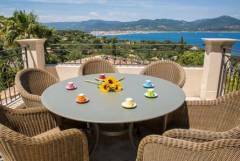 From various vantage points in and around the house, you can also see Port Grimaud, Port de Cogolin, Beauvallon and Sainte Maxime. The villa’s strategic position on a small hilltop means that it gets both the morning and the evening sun. You’re sure to find any number of favorite places depending on the time of year or the time of day. Despite being so close to the lively town of Saint Tropez, the garden and the pool offer complete peace and quiet. And thanks to the private access road, there is no through-traffic.